The 9 Best Bike Shops in North Dakota! Few things are more freeing when the weather is nice than hopping on a bike and hitting the open road. Whether you are a recreational rider or someone who takes the sport more seriously, North Dakota has a variety of top notch bicycle shops that can help you put the pedal to the metal and rack up those miles. Here are the best in the state. If you are an extreme sports lover, Paramount Sports is for you. With a wide variety of bikes and cycling supplies, as well as equipment for snowboarding and skiing, Paramount is the place to go to get ready to get your extreme groove on. In addition to new equipment, the store also does repairs and tune-ups. If you are looking for a mountain bike adventure, Dakota Cyclery is for you. They offer a variety of biking supplies as well as rentals for those that want to tackle the famous Maah Daah Hey trail. Individual and group cycling tours are also available. Nothing will give you a better understanding of the beauty of North Dakota faster than a trip through Medora. The locally owned Ski & Bike Shop is your one-stop shopping destination for outdoor gear, bicycles, snowboards, and skis. The store’s on-site professionals can give you one-of-a-kind advice and guidance that you won’t find elsewhere. Service packages are available and information about group rides and special events can be found on their website. For anything to do with cycling, Great Northern Bike Company is the place to go. Unlike other stores that feature a variety of outdoor or extreme sports, biking is all that Great Northern does. 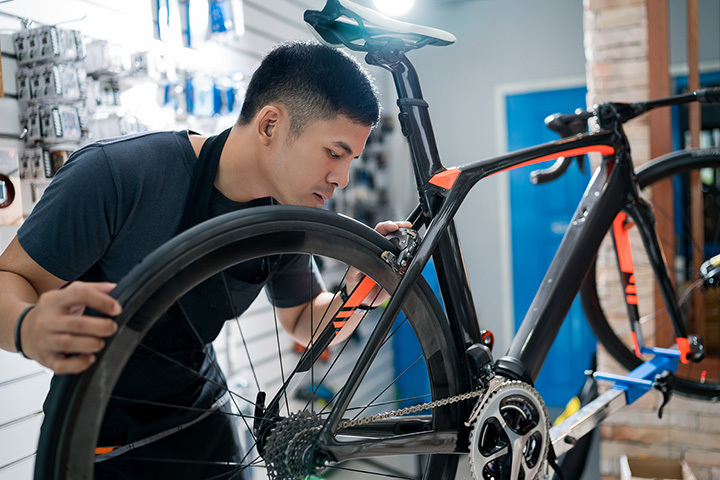 They are experts and can help you do anything from fine-tuning your bike before a big ride or choosing new equipment altogether. Group rides and special events are also coordinated through the store on a weekly and monthly basis. On the western side of the state, Val’s can hook you up with anything you need to get or to keep your bike on the road. From new and used bikes to trip supplies and adventure clothing, Val’s offers everything your cycling heart desires. They are also a “saw” shop, and they sharpen everything from kitchen knives to chainsaw blades. In addition to a wide variety of cycling supplies, 701 Cycle and Sport also carries swimming, running, kayaking, and paddle boarding, making it much more than just a cycle shop. On the bicycle side of the isle, however, you will find anything and everything you need to keep the wheels turning. Classes and training sessions are also available. In addition to offering high-quality cycling products and timely repairs, the Cyclist’s Cove also features a wide variety of food and beverage choices that can help you make the lifestyle changes you desire. Their café serves everything from coffees and organic teas to sandwiches and protein bars. The newest bike shop on the list, Larson’s Cyclery is nevertheless equally as equipped to help you with your cycling needs. In addition to a variety of cycling products, Larson’s also offers repairs and even custom wheel builds. If you are from the Midwest, you are aware of all Scheels has to offer in terms of athletic clothing and supplies. What some don’t know, however, is that they also offer a wide variety of cycling supplies and equipment, including new and used bikes. Scheels also has a full-service repair shop for those moments when the rubber can no longer meet the road.